Enjoy Utah! : North Pole Express DISCOUNT TICKETS! North Pole Express DISCOUNT TICKETS! CLICK HERE TO READ OUR FULL REVIEW ABOUT OUR EXPERIENCE ON THE NORTH POLE EXPRESS! Heber Valley Railroad's "North Pole Express" is a magical journey Utah families will treasure this holiday season. As a new twist on an old tradition, the North Pole Express will feature a live reading of "The Night Before Christmas," a classic holiday favorite that will come to life as families enjoy a festive ride to the North Pole. Guests aboard the North Pole Express will enjoy singing carols, sipping hot chocolate and eating cookies while reading along or listening to the "The Night Before Christmas." Children are encouraged to wear their pajamas for the ride. Upon arrival at the North Pole, Santa and his sleigh will greet the children and give each child a special Christmas gift. Tickets are now on sale for this popular holiday train, which is a long-standing tradition for thousands of Utah families. First class service is available most weekends during the North Pole Express schedule. 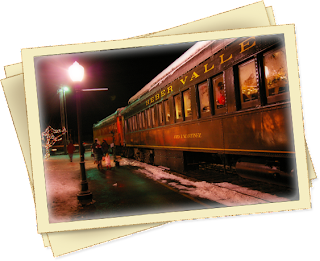 Due to the high demand for tickets, the Heber Valley Railroad is offering two matinee excursions on Thursday and Friday, Dec. 23-24, 2010. The North Pole Express will depart every Monday through Saturday through December 24, 2010. Depart 5 p.m.; return 6:30 p.m. Depart 7:30 p.m.; return 9 p.m. Depart 2 p.m.; return 3:30 p.m.
435-654-5601 and ask for the "Utah Blogger" discount. You will also need to mention Enjoy Utah! to get this discount! (Think about it.....if you are a family of four, that's a $20 savings! The Heber Valley Historic Railroad dates back to 1899, when trains served the pioneers who first settled the valley, and now operates as a nonprofit organization. Depending upon availability, vintage coaches are pulled over this beautiful vista either by one of two 1907 Baldwin steam locomotives or by one of three vintage diesel electric locomotives. Over 95,000 passengers ride the train each year, and that number is steadily growing. For more information on the Heber Valley Railroad and its 2010 schedule, visit http://www.hebervalleyrailroad.org/.